There are a lot of words here, so I’ll get to the point up front. TL;DR – If your conspiracy theory is more easily explained by Malcanis, your conspiracy theory is probably wrong. There, saved you 3,000 words. Also, don’t take this all too seriously. This was very much a stream of consciousness “blast it out in one go” sort of post. More so than usual even. Of course, in saying that I know people will take this as seriously as suits them. Such is the way of the internet. If you play multiplayer games… online multiplayer games… and you are not aware of Malcanis’ Law, then let’s correct that right now. Here is the most common version. Whenever a mechanics change is proposed on behalf of new players, that change is always to the overwhelming advantage of richer, older players. Examples of it show up all the time, especially when you consider that “older players” is a category that includes not just age but skill, experience, depth of knowledge, and even a commitment to a game and its mechanics well beyond any new player. It explains why game companies do not do certain things and why, when they do, they do not turn out as expected. Like any such “law” it is a general statement and applies to trends in a population rather than specific individuals. New players, after all, do not remain new players forever. Well, some do, certainly. We’ve all seen them. But many become the rich(er) and older players who then become the beneficiaries of change. Others become former players, but that is another story. But the law continues to apply even as individuals move from one group to another. Sometimes the exchange doesn’t seem so bad. Sometimes you just let the vets have their thing just to get something to new players. Blizzard giving a level boost out with the expansion gets new players into the current content and up with the bulk of the player base, the latter probably being more important than the former. It doesn’t make a new player a good player or given them much in the way of special insight into the game or how to play their class, but at least they are likely to be in the same area as their friend. A veteran player with a character boost will quickly have a potential new alt with all of the account-wide advantages and the knowledge and gold to make that character a winner quickly enough. That isn’t an overwhelming advantage… I think Malcanis overstates that in the law… but it is clearly an advantage. If you want a more egregious example of the law, we need only look at skill injectors in EVE Online. EVE long had a perceived problem with its skill training system. Since it runs in real time, there was no quick way to gain skills. You had to fill up your queue… or pick a skill regularly in the days before there was a queue… and wait. You could optimize a bit with attributes and implants, but in the end time had to pass. This meant, as an example, that somebody who started in 2003 was always going to have more skill points than somebody who, like myself, started in 2006, so long as we both stayed subscribed and actively training. Thus one oft heard complaint was that new players could never catch up, and as the years went along the perceived gap between new players and veterans only grew. The solution to this problem was the aforementioned skill injectors. Now a new player could… by spending real world cash on PLEX since they certainly hadn’t earned enough ISK in game to pay for it that way… catch up with veteran players. And I am sure a few did. Mostly though it wast the rich getting more powerful as a result. We saw IronBank use their casino ISK to max out all possible skills. What happened more commonly was that rich players were able to bypass the nearly two year training cycle for a titan alt. That was likely a greater limiting factor on the number of titans in the game than anything else by the time skill injectors rolled around. That the Imperium was able to field nearly 500 titans for the final Keepstar battle at X47 was largely due to skill injected alts. Basically, to avoid Malcanis you have to make changes that are so crappy or so innocuous that they don’t really impact new players or old. Something like Alpha clone skill injectors you have to buy daily and which only boost you up to the point of Omega skill training speed, which no vet would likely bother with. But since we already have regular skill injectors, why would they? They’d have to unsubscribe and go Alpha for no reason. The thing about Malcanis is that it works both directions. The corollary to the law might well be that any mechanics change that is proposed to limit or retard richer, older players will harm new players even more so. There was an example of this in EverQuest II. Back in EverQuest there were complaints in the forums about twinking. Yes, there were complaints in the SOE forums about almost everything you can imagine, but the company seemed to listen to this complaint. Twinking is using your high level friends or alts to power up a low level character in order to speed up leveling. Back in the day in EverQuest this was pretty common, something inherited from its DikuMUD origins. Gear wasn’t bound to a character and had no level restrictions, though sometimes a proc would only work if you were above a certain level. I recall Ghoulbane, an undead smiting paladin sword, having a level limitation on its proc, though the sword itself could be wielded by a level 1 pally. And, likewise, high level buffs that gave huge boosts to stats and hit points were free to be applied to low level players. When EQII rolled around SOE seemed to have gone way out of its way to close off twinking. Gear had level restrictions. Buffs were of very short duration, scaled down to low level players, and in some cases could only be applied to people in your group. There was a formula that dictated the maximum level range of players in your group, so players too low in level would not gain experience. And then there was the whole encounter locking aspect of things. Gone were the days of happily buffing low level players. The only thing they missed initially was bind on equip gear, which they fixed as soon as that started to kill the market for player created items. And this created the usual divide. Sure, at launch the difference between new players and veterans was paper thin, but it was telling. People entered the veteran class by showing up with friends, forming a guild, and grouping up to play. A regular group was a ticket to success, especially since a lot of the content past the fields in front of the opposing cities of Qeynos and Freeport were heavily skewed towards group play, which caused the minor gap to become a major one past level 20 or so for a lot of players. So when I hear people suggest that the Monthly Economic Report indicates that sovereignty fees or structures ought to cost more, I know who can afford any price increase: The rich can. Goons can. Raising those prices would only harm smaller organizations and put a limit on the ability of newer organizations to enter null sec. And that was what Fozzie Sov and increased population density was all about, giving those sorts of groups that opportunity. Because, of course Malcanis extends itself beyond players to groups as well. As noted in the EQII example, a situation existed where being a part of a group gave an advantage and went far towards setting up the optics of the veteran/new player, rich/poor, winner/loser split. Malcanis favors those ready to take advantage of change, which brings me back to EVE Online. Gevlon, who once swore he was done talking about the game, cannot let go and has recently been back on his “CCP picks winners” excuse for leaving the game. Well, there was that and the fact that CCP Falcon made fun of him, but that was so mild and of absolutely no consequence as to sound crazy as any sort of excuse. From my point of view, which is from within the Imperium and thus on the side of Goons, this theory looks more than a bit off. Certainly anybody who spends any time in the GSF forums will start to get a sense of the institutional paranoia Goons have about CCP. While they may be Lowtax’s chosen people, they certainly do not feel like Hilmar’s favorites. Some of this is just paranoia I am sure, but the relationship between Goons and CCP has been peppered by enough events over the years, from the T20 scandal (one of the rare cases of actual developer corruption, but did not favor Goons) to the “No Sions” rule for the CSM a couple of year back. I don’t buy into it myself. CCP seems ready to ignore input and inflict pain on all comers at times, but the downtrodden under dog origins of Goons seems so essential to their identity in game that I doubt it will ever go away. To merely survive against the odds you see stacked against you is to win, and to actually win in that situation can be transcendent, even if it is founded in a fiction. Were citadels a gift to Goons? They sure didn’t look like it when the hit. The Citadel expansion went live in late April of 2016. And where was the Imperium living then? In the Quafe Company Warehouse station in Saranen. I mean, we still held much of Pure Blind, and Vale of the Silent was technically not lost yet, but that was all well on its way to being lost. Circle of Two had betrayed us and swapped sides, SpaceMonkeys Alliance was spent and left the coalition to recover (only to fold up shop), FCON headed out the door without bothering to stop in Saranen, RAZOR looked to be on its way out, and membership in the surviving alliances was in decline. Darius Johnson, having somehow been given possession of the original GoonSwarm alliance was calling for “true Goons” to come fly with him, an offer which found few takers but which was exploited for propaganda value. And in the midst of that, while we were living in a low sec station and undocking daily to take the fights we could manage, citadels showed up. Soon there were three Fortizars and an Astrahus on grid with the Quafe Factory Warehouse station, all hostile, while in 93PI-4 there was an enemy Keepstar anchored so the Moneybadger Coalition could dock up their supercapitals just on gate away from Saranen, from which they could drop on the near portions of Black Rise as well as covering Pure Blind. That was a hell of a gift for somebody. It sure didn’t seem like it was addressed to us though. The war was lost. We obstinately held on until June before calling it quits, after which we began the migration to Delve. There we had a region to conquer, though the weakness of the locals meant there wasn’t much of a barrier to entry. The only worry was if the Moneybadger Coalition would live up to their promise to keep us from ever forming up again. As it turned out, that was mostly empty talk. The new north was too busy settling into their new territory to bother and thus only made a few minor attempts to thwart us in Delve before giving up to fight amongst themselves. At that point pretty much all of the major null sec changes were in place. The regions had been upgraded so there was no more “bad sov” to avoid. Any system could be made a ratting and mining paradise with the right upgrades. Fozzie sov was in place. And citadels were now the new thing, allowing groups to setup stations wherever, with the Keepstar variety allowing supers to dock up, allowing those alts to escape their space coffins. While we had to police Querious and Fountain to keep hostiles at bay as well as dealing with the dread bomb threat from NPC Delve, much of the months after taking Delve were relatively peaceful. We were not at war and we weren’t keen to get into another one having been soundly beaten. Instead, the institutional paranoia served us well as the coalition began to work to stockpile ships, material, and ISK to defend our space lest our foes unite and come after us once again. But nobody did. PL and NCDot turned on TEST and CO2 and threw them out of the north, while the rest of the sov holding victors settled into their new northern fiefdoms. So the Goon drive to restore its power was mostly unchecked. 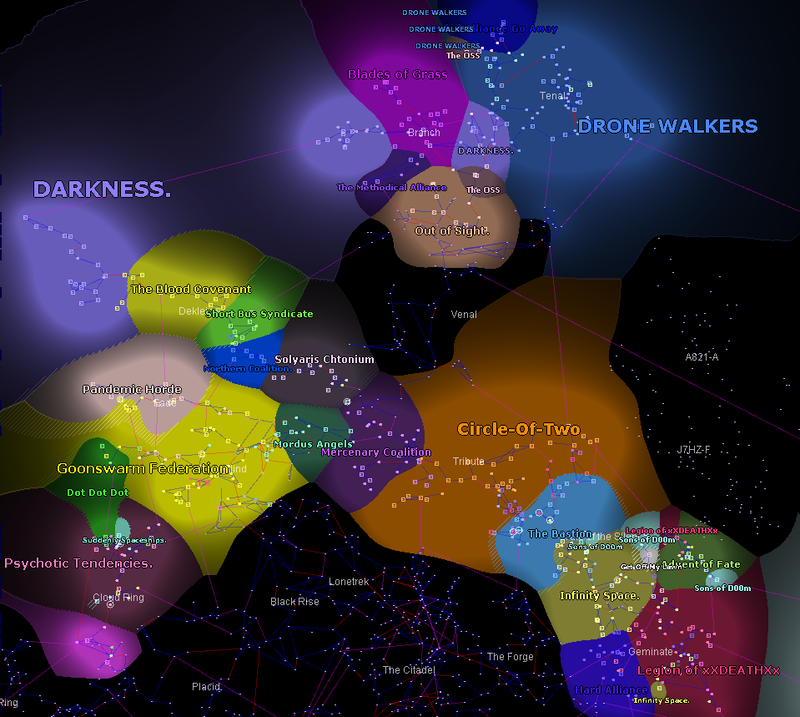 Soon we had our own Keepstar, then two, then many. They were a part of the game and we were going to use them. KarmaFleet expanded to become an even more essential part of GSF as the long insular Goons sought to expand the levee en masse option that Brave Newbies had championed and that Pandemic Horde used so effectively during the war. Ratting and mining was deemed important, both to raise defense levels of systems and to feed the expanding war machine of Delve, so incentives were offered including, for a while, PAP links for mining and ratting fleets. You could fill your monthly participation quota by making ISK. Then there was the Monthly Economic Report which, as Ayrth put it, became one of the Imperium’s best recruiting tools. Come get rich with us in Delve! We were not only getting rich, but we were living out the “farms and fields” idea that had long been proposed for null sec. If you lived in your space you benefited. If you just held it but lived elsewhere you did not. And yes, this is all a dramatic over simplification told from my own point of view, omitting various details, both pertinent and not. But the overall point survives even if you tell it from a completely Moneybadger perspective, call it World War Bee, and emphasize the failings of the losers. The Imperium lost the war and won the peace. That’s what the Monthly Economic Report tells me. As an organization the Imperium was both prepared and motivated to adapt to the changes in the game and to take advantage of them in ways that almost no other null sec entity was. When external casinos were cut off as a source of wealth in the game, did those who depended on them change their ways? Last year, when moon mining went from a passive activity to the new active collection method now in place, how many other groups adapted as well? The only old school revenue method left is rental space, which I am told NCDot does very well by. The lack of bad sov anymore means their rental base can be smaller… once a huge swathe of null sec… yet viable. But overall Goons adapted to the changes, and worked very hard at it along the way, while other groups did not. So if you are putting forward the proposition that CCP picks winners, that they have chosen Goons to win EVE Online, whatever that means, it is pretty much on you to explain what CCP should have or could have done differently that would have changed the outcome. Did Fozzie sov changes favor Goons? It sure doesn’t look like it. Did null sec density changes favor Goons? They didn’t save us during the Casino War. Did citadels favor Goons over others? Just saying it doesn’t make it so, you have to prove that their lack would have changed something. Otherwise no. Did removing casino wealth favor Goons over others? Only over the groups that depended on it. Who will raise their hand and claim to be in one of those? Did moon mining changes favor Goons? It seemed like we were doing fine mining moons the old fashioned way. Goons had to change like everybody else. That is four negatives and a semi-sorta for specific entities. In the end, saying that CCP favors Goons sounds a lot like an excuse for those who would not put in the work and adapt to changes. But I guess “Well sure they won, they took advantage of the changes!” doesn’t sound as good. Basically, it is all on Malcanis here. The group willing and able to take advantage of the changes rather unsurprisingly came out on top. That is what the rule always sums up to in the end. And now there is a new war in the north and the Imperium is spending its accumulated wealth and putting hundreds of titans on the field. Keepstars are dying and the combined losses overall reach into the trillions of ISK. We’re throwing ISK and resources onto the fire of war. I don’t know if we’re going to end up like the Serenity server in the end, where one group emerges as so dominant that null sec is effectively over. But if EVE is dying at last, it won’t be because CCP picked the winner. It would also be very much against CCP’s best interest for them to pick a winner, so why would they? Not picking specific winners is different from not favoring specific play styles. CCP’s vision is clearly that null sec is the end game and other areas suffer for it. Null sec coalitions are inevitable. There will always be a blue donut. While there were a bunch of new groups in null with Fozzie Sov, eventually everybody had to find allies to survive. While I poke at the Moneybadger Coalition for not following the Imperium to Delve to keep them down, it is remarkably difficult to suppress a group that otherwise holds together. I am not sure it can actually be done. Lots of groups have suffered catastrophic setbacks and returned to be a power. Some examples of this are the Goons in the Great War, TEST after the Fountain War, and CO2 after The Judge betrayed them and GigX was banned. Real world analogies, especially WWII analogies, are always wrong. New Eden isn’t the real world. We don’t live there and, more importantly, we don’t die there. We respawn and carry on. If your comment on this post immediately jumps into RMT… then welcome back Dinsdale. Haven’t seen you for a while. This entry was posted in entertainment, EVE Online, Null Sec and tagged Casino War, Friday Blog Wars, Gevlon, Malcanis, Rambling Detected, Rambling Friday, Skill Injectors, So Many Words Please Stop on August 24, 2018 by Wilhelm Arcturus. Very good article in my opinion. I fought against you guys during World War Bee (yes, I’m actually calling it that ;-) ), and my assessment of how everything developed is pretty much the same as yours. If CCP in fact wanted Goons to win EVE they did an extremely poor job at it for sure. @Mailvaltar – Topics are like the wind, free to travel where ever they see fit. Very good post, I enjoyed it. Ah yes, the classic Gevlon revisionist history response. That link above is a keeper. I’m not one to collect tears, but I clearly hit a nerve. Remember, I only brought this up in response to his going on and on about EVE years after he said he had let go. This post was literally a response to his assertion, but now he is spinning it as big bad Goons still haunting him. This is why he doesn’t like comments, because it lets reality intrude on his safe little narrative. He likes to call people morons and slackers but disagree with him and he comes unglued. I left him a comment but I am sure it will never make it out of moderation. The real joke is he is 100% serious. The dummy who spent 1000 games in silver in LoL, the .01 KDA PUBG no-lifer, little penny Lenny, the mini-meme of EVE honestly believes he could take down Goons when groups like PL and NCDOT have tried and failed. I wish he kept his real-world hatred to himself rather than being open about it on Reddit, because I do miss laughing at his failures and insanity sometimes. Having never played EVE I cannot comment on the game itself, but Gevlon was instrumental in me making the decision to not play the game – based solely on his developer corruption claims. He does make good points about certain things. That is, if they did, in fact, actually happen. I have to wonder if the things he talks about, aren’t that they benefited the Goons more, or if he just failed to adjust his play-style in a timely enough manner to benefit from the changes? Also, were the changes that Gevlon talks about actually ever addressed by CCP openly as to why they were done, and were they openly announced so that the entire player base was informed prior to implementation? @NoGuff – CCP communicates future changes via dev blogs and takes feedback better and more completely than most other companies. Every change mentioned was talked about, dissected, complained about, and played through on the test server before it went live. There were no surprises. Which isn’t to say CCP doesn’t do dumb things. There have been many occasions where the players have pointed out a possible flaw and CCP has gone ahead, only to have to fix the flaw later when it became obvious that the complaints were dead on. I think the main compelling argument against Gevlon’s corrupt developer idea is self-interest. CCP has no other source of income besides EVE Online. They screw that up, show themselves to actually be favoring one side or the other in the game, and they are done. What benefit would they get from favoring a group in game that would off-set that possible outcome? You can pretty much discount anything Gevlon says about him and CCP Falcon. That is all just a smokescreen, an excuse to leave the game, and has no real bearing on anything. I don’t always like CCP Falcon, but his behavior is consistent Gevlon or no Gevlon. And Falcon does have to deal with people like Gevlon, and worse than Gevlon, all the time, so I cut him a lot of slack. @Gevlon – Aren’t you afraid you’ll get Goon-cooties if you hang around with evil minion propagandists? So now you have the Netherlands and a single developer in Belgium. That is a pretty slow pace even if we consider the Benelux nations the whole world. You appear to be very, very, very far from your prediction just on the lockbox front. I mean, this came up just yesterday. 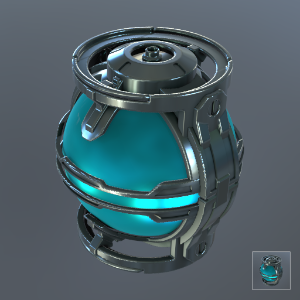 More lockboxes! Meanwhile the matchmaker thing has no traction at all and will never come up as an issue anywhere. Not even in the Benelux nations. @NoGuff – Gevlon lies 90% of the time (the other 10% is pointing out the sky is blue), and his claim that he was having success vs goons is one such lie, that he then tried to cover up by claiming Falcon joking (like almost all EVE players do) about Gevlon’s insanity was somehow a tipping point in influential people to not taking Gevlon seriously (It’s also important to note here that prior to Falcon’s comment, Gevlon had a mile-long trail of making lies up about CCP, both on his blog and on Reddit, which Falcon likely had some idea of). Its again why he tried and failed multiple times to start a corp (people don’t follow a failure), never rose to any position of power in a corp/alliance, and never achieved wealth that mattered on the scale that Lenny went on to show during the Casino War. 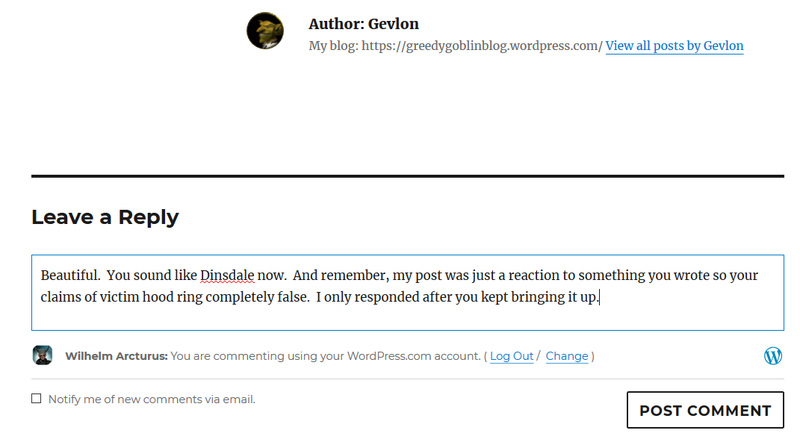 But if you only read and actually believed Gevlon’s blog, you’d think he was someone important in EVE that had a real impact. His blog is an unintentional comedy blog, and I feel bad for anyone who doesn’t see it as such. Also remember he tried to do all of the above over the course of 4 years, likely putting in insane hours the entire time (he hated LoL and played that 16hr+ some days, what do you think he did in an MMO he actually enjoyed? ), so from that standpoint it makes sense why he is so bitter about his failures, and why he twists himself around so much to explain them (for a mini example of this behavior pattern, look at his ultimate admission that his failure in LoL was his own doing, and not dev corruption as he originally claimed over and over to try to explain 1000 games without progress in the starter league). That’s basically all I needed to know. If the Dev’s were open and forthcoming about all of the changes that Gevlon indicates as somehow being corrupt, then it is all on him for not making the proper adjustments. I’m not here to bash him, just trying to get an understanding of all the discourse that exists around his EVE claims. I don’t know about the 90% lying thing. I started following Gevlon back when his blog was focused on WoW and how to make gold by playing the AH, and to his credit, I made tons of gold following his examples. I think his major issue is that he tries to get way too philosophical about certain gaming related topics, and it is detrimental to his cause. Whatever that is. @NoGuff – Can’t comment on WoW during the welfare epics era, as I stopped playing during BC, but making money in WoW even back then was trivial because 90% of the playerbase doesn’t care about it. Perhaps that’s changed now with tokens, but I doubt it. What I do know is he tried to get rich in EVE, originally hauling badgers station to station while talking about how fitting Titans as tackle ships was superior strategy, and he failed both in wealth as the Casino War showed, and of course in his meta suggestions. What I find most sad about the whole situation, his ugly racism aside, is people fall into his trap of lies, and that spirals pretty fast in almost a cult-like way.